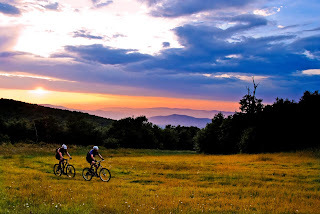 Avid mountain bikers and hikers now have a superb new venue in Western North Carolina. The Beech Mountain Adventure Trail Park officially opened its Emerald Outback section May 1. The eight-plus miles of Emerald Outback trails range in elevation from 4,700-5,400 feet, giving the park the distinction of being among the highest such venues on the East Coast. There’s a nice combination of single track, double track and gravel road trails traversing the mountaintop, all accessible from a trail head in the town of Beech Mountain. The Emerald Outback is the first phase of the Beech Mountain Adventure Trail Park, which will grow to three phases encompassing 25 miles of trails. It was designed by mountain bikers, hikers and trail runners to meet the recreational demands of serious outdoor enthusiasts. Credit for building the park goes to Beech Mountain Parks and Recreation Department. Fitness and wellness coordinator Daniel Scagnelli conceived the idea in 2009, and spearheaded an impressive trail-building effort of mostly volunteer labor. Workers used hand tools and hand-held power tools. Heavy machinery was not involved. The process reclaimed a few abandoned trails and blended them into a cohesive network of trails showcasing unique topography atop Beech Mountain. “We actually routed one trail over a former ski slope. It’s fairly flat with moderate elevation change,” Scagnelli said. “Then we have the typical rocky, rooty East Coast mountain biking single track. Signage and the official trail head were installed this spring for the Adventure Trail Park, which is free and open to the public seven days a week. For trail park information, call (828) 387-3003, or visit: http://www.beechrecreation.org/.